According to new research published in the journal 'Nature Geoscience', Saturn's hazy moon has surprisingly extreme rainstorms. While these methanestorms are rare on Titan (less than once per Titan year, which is about 29.5 Earth years), they occur much more frequently than researchers expected. “The storms create massive floods in terrain that are otherwise deserts. 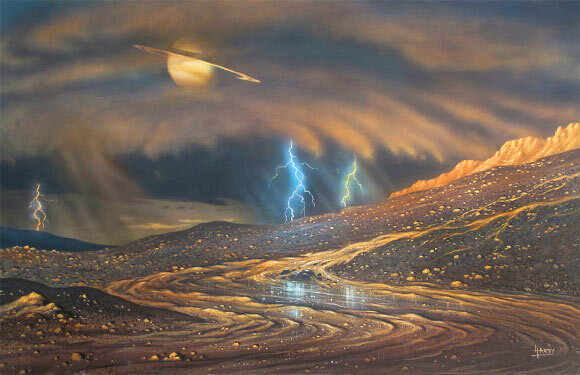 Titan’s surface is strikingly similar to Earth’s, with flowing rivers that spill into great lakes and seas, and the moon has storm clouds that bring seasonal, monsoon-like downpours," said study co-author Dr. Jonathan Mitchell, from the University of California, Los Angeles. But Titan’s precipitation is liquid methane, not water." The researchers took advantage of computer simulations to study Titan's hydrologic cycle due to the difficulty of observing actual precipitation on Titan and the length of each year on the moon. “We found that regional patterns of extreme rainfall on Titan are correlated with recent detections of alluvial fans, suggesting that they were formed by intense rainstorms," said the authors. “The principle likely applies to Mars, which has large alluvial fans of its own, and to other planetary bodies." Image credit: David A. Hardy, AstroArt / NASA.